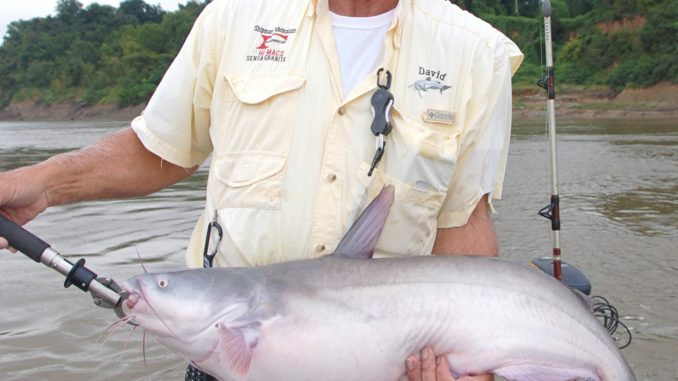 Suspend-fishing is a great catfish tactic on the Mississippi River. Forget what you’ve learned about catfish always being bottom dwellers. Catfish pros like David Shipman of Corinth know they suspend and have figured out how to catch them higher in the water column. Angler David Shipman said catfish may suspend anywhere from just a few feet off the bottom all the way up to just below the surface. 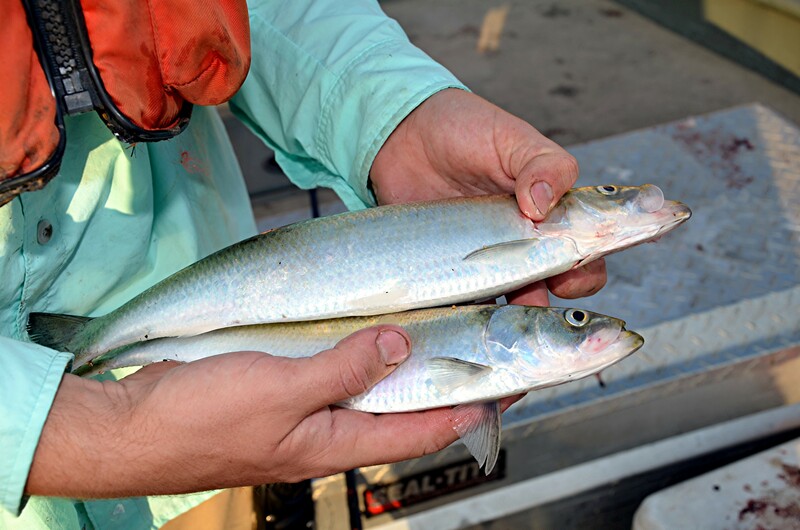 Skipjack herring are relished by catfish anglers who catch them during the fall and freeze them for year-round use. While catfish readily feed on the bottom, finding them off the bottom is almost a sure sign they’re hungry. High-grade electronics will show their position. 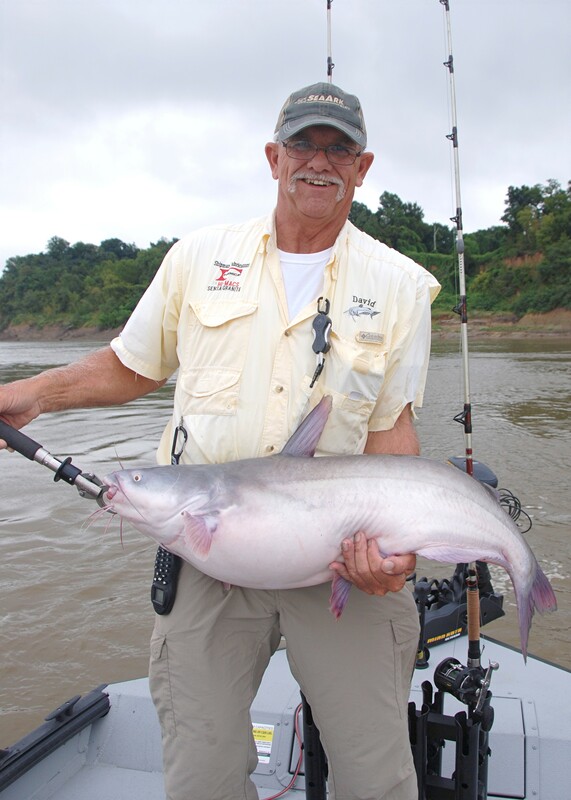 Fishing for suspended cats is a great tactic to use on the Mississippi River or anywhere else with a big population of catfish. Here’s the skinny on skinning suspended cats. • Mourning doves sit on power lines along Delta grain fields. • White-tailed deer peer out from hardwoods groves. • Largemouth bass lurk in lily pads. • Crappie hang out in brush piles or along contour changes. • And catfish lay on the bottom. Granted you’ll find each of these animals in different surroundings, except, by popular belief, catfish. Catfish are bottom-dwellers. Everybody knows that. Why would you look for them anywhere else? As hard as it is to comprehend, catfish don’t always lay on the bottom of the river, lake or pond — or whatever body of water you find them. Sometimes, catfish suspend. That’s right, they swim up off the bottom and hang out near the middle of the water column or even close to the surface. Like a lot of fish, a catfish’s eyes are positioned on top of its head. This doesn’t mean catfish rely solely on their eyes to find things, such as food, but it does suggest they can and do look up — and even sometimes swim up off the bottom. 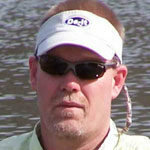 David Shipman of Corinth is a big believer in catching suspended catfish. It’s something he has done ever since a day 35 years ago when he was fishing for bass on Tippah County Lake with a buddy. The boat they were in had an old flasher unit for sonar, and Shipman kept seeing marks at 17 feet while fishing in 30 feet of water. 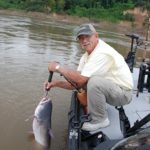 After dropping a whole nightcrawler over the side of the boat down to 17 feet, Shipman spent the remainder of the trip hauling in 3- to 5-pound catfish. It was a lesson he never forgot, and one that serves him well in his current past-time as a tournament catfish angler. 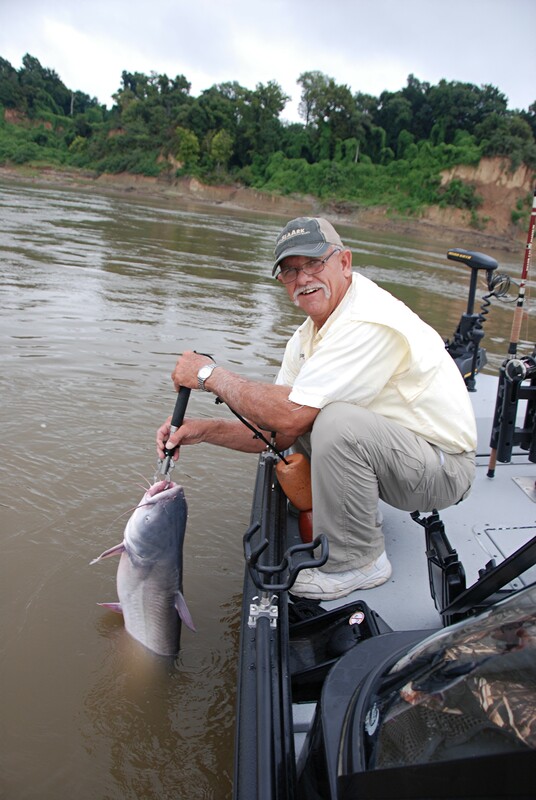 Shipman fishes nearly every type of water that holds catfish, but he is especially fond of the Mississippi River because of the number of trophy sized blue catfish the river produces. 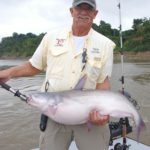 He uses a number of tactics to catch catfish in Big Muddy, including bumping and anchoring, which are both bottom-fishing tactics. But he said his strength is catching suspended catfish. Shipman sets up his boat with a rod on each corner. His preference is B’n’M Magnum catfish rods ranging from 7½ to 10 feet long. With each rod secured in a rod holder, he will drop baits on a modified Carolina rig and use his trolling motor to bump around so that baits and the line stay vertical in the water column. One of Shipman’s favorite scenarios is to find catfish suspending over structure. A brush pile is a frequent example, and fish are in a neutral or even a negative feeding pattern. They’re just sitting there. Once the fish bites, the odds are definitely in Shipman’s favor. He uses anywhere from 65- to 100-pound braid on his reel and threads a 2- or 3-ounce egg sinker on the line. He will use up to 16 ounces of lead if he’s in that heavy current he prefers not to fish. Adding a round rubber bumper to protect the knot from the weight, he ties a heavy duty barrel swivel to the main line and then up to 3 feet of 60-pound mono for a leader. On occasion, he may use just a single hook, but if he’s tournament fishing or targeting big catfish, he will double snell two hooks about 7 or 8 inches apart. 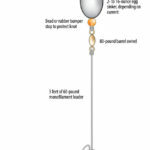 The bottom hook is a 5/0 or 7/0 circle hook, with a 3/0 or 5/0 circle hook snelled in line above the larger hook. 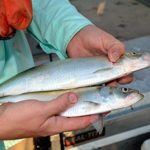 On occasion, he might opt for two smaller pieces of bait, but more often than not, he’s going to double-hook one big bait and fish it so it rides flat in the water. Skipjack herring is his preferred bait. 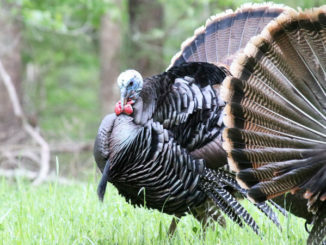 He catches them from a variety of places along the Tennessee River and its impoundments and freezes them in vacuum-sealed bags to insure he has bait year-round — is his preferred bait. 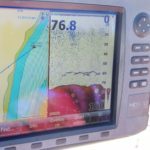 If he’s not actively marking fish up in the water column, Shipman said he will drop the rig to the bottom and turn the reel handle three or four turns so the bait suspends a few feet off the bottom. He doesn’t like to get mud on the bait, surprising since catfish readily take bait off the bottom in the mud. 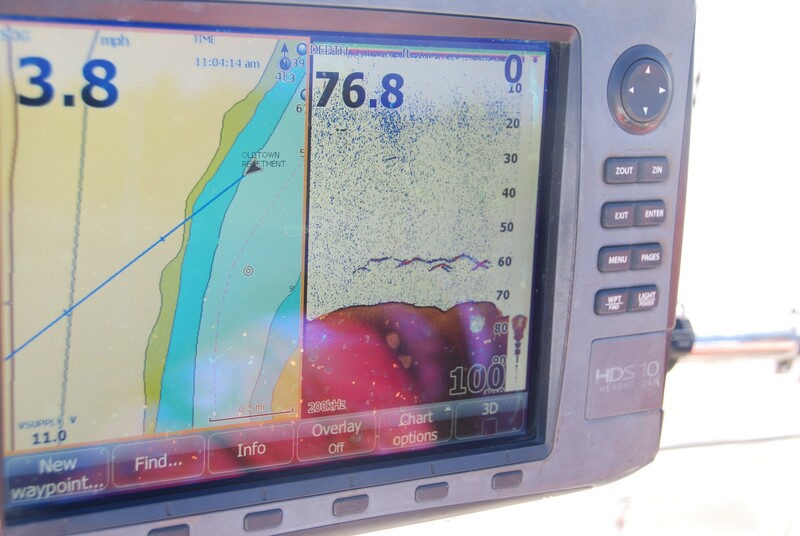 As for locations, Shipman lets his graph decide where he’s going to fish. He said oxbows that are either open-ended or closed off from the main river are the kind of location that has consistently produced on the Mississippi River. Oxbows typically don’t have the same current flow as the main river, which might explain why catfish are more prone to get up off the bottom, as well as why suspend fishing for them works better.